Use the Jaxx® Shaker Cup to enjoy your protein shake, weight loss supplement, powdered mix or water! The unique weight and shape of the green-colored agitator was designed to powerfully mix even the thickest powders. No clumps. BPA Free and safe and easy to clean in the dishwasher, this shaker bottle comes with a secure, tabbed lid to safely mix your favorite protein shake or smoothie. Green bottle, duo-tone green lid. Green-colored agitator. 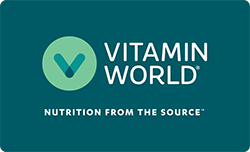 Official Vitamin World logo on front of bottle. Jaxx® Shaker Cup is rated 4.4 out of 5 by 5. Rated 5 out of 5 by colleen from Best shaker cup Great size and shape, snap lid stays closed, no leakage, like the plastic shaker "ball" inside better than the usually metal round ones. Rated 2 out of 5 by vicc63 from small round on top does not close and seal Must hold the top down when mixing to avoid leaking. Rated 5 out of 5 by Jess from Great product The cup is easy to use, especially for protein shakes and is great for on the go. Rated 5 out of 5 by Anonymous from Cup Great for outtings and on the go.